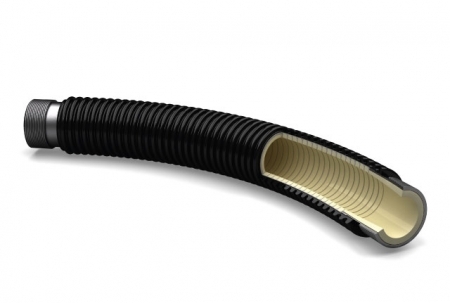 The patented ceramic conveying hose comprises of ceramic rings that are cured together with special rubber materials. The ceramic rings have a slight conical shape so that rubber joint remains protected away from the area of flow. Up to 3 layers of reinforcement fabric are inserted into the rubber layers in order to achieve the appropriate pressure resistance. CeraFlex is manufactured in three pressure stages, also for vacuum. In order to prevent electrostatic charging in the media, antistatic types of rubber are used. Furthermore, electrically-conductive ceramic rings are used for media that are heavily prone to charge separation. When it comes to this type of construction, it is primarily hoses with a small diameter that can be manufactured inexpensively. The weight of the hoses is amazingly low and the flexibility is equivalent to rubber conveyor hoses. The possible bending radius amounts to ten times the diameter. The excellent service life of Cera Flex is primarily achieved by the fact that the ceramic lining does not have any joints along the conveying direction. The medium is always guided back into the centre by the conically arranged ceramic rings. The transition to the connection is metallic complete with ceramic lining. In order to exclude wear in the coupling, the required connecting unit is also ceramically lined.